I loved the simple, classic styling of this session. I’ll be the first to admit that styling girl sessions is pretty easy – headbands, florals, delicate wraps. But boys can be more of a challenge. We did a neutral color palette here with a pop of blue and I just love the way it turned out! The best time to schedule your newborn baby portrait session is while you are still pregnant. Most moms book during their second trimester. 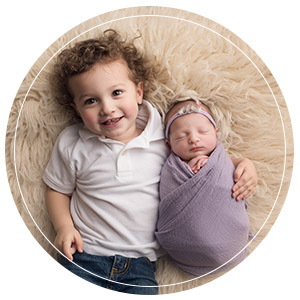 Julie Freitas Photography is an experienced newborn photographer located on the North Shore of Boston. She has worked with over 400 newborns (and counting)! Read more about the process and what to expect here. Sessions take place in Julie’s Beverly, MA portrait studio. The studio is fully stocked with accessories – hats, headbands, wraps, baskets – anything you could want for your customized session!